We love green beans, and usually grow runner beans every year. I try to can up at least four dozen pint jars of runner beans every year to store in our Cold Room. Because I want to be able to put up as many jars as possible, I look for plants that will give us the highest yields in a small growing space. 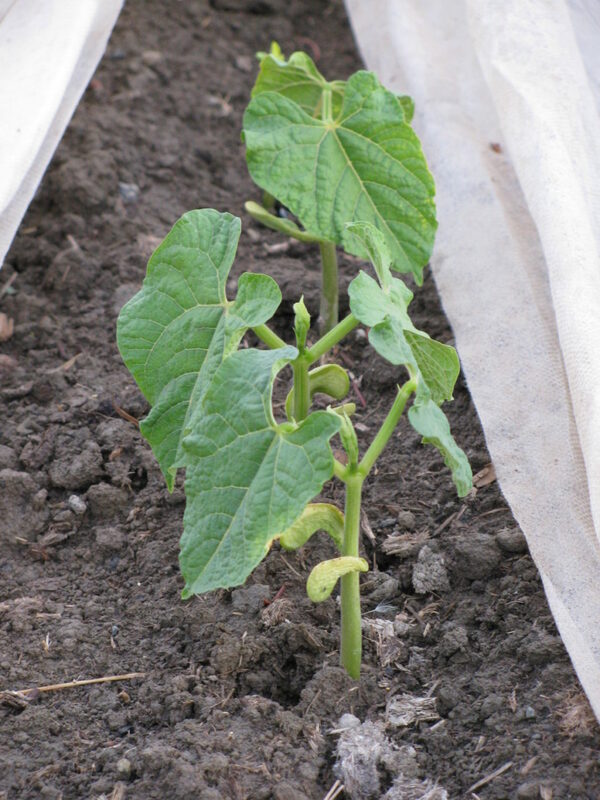 Even though I look at different varieties of runner beans, I usually end up planting Scarlet Runner pole beans. I’ll get a much higher yield growing pole beans as opposed to bush beans. They are the same bean, but the bush bean stays small and the pole beans, well, they climb poles! Since our temperatures can fluctuate so much from morning to night, we decided to not take any chances and plant the beans in the Greenhouse. Beans do NOT like a frost. 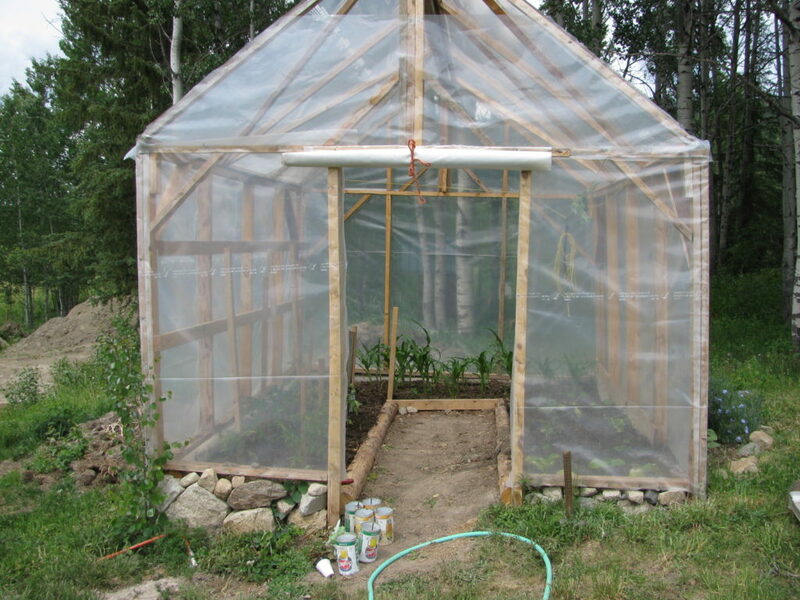 Our Greenhouse – we built this in 2007. It has served us really well and we haven’t even had to replace the plastic. 10 mm is recommended for Greenhouses, but we used regular Builder’s Poly (6mm) that we had left over from building projects. We built our greenhouse right over the manure and compost piles, saving us a lot of time and ensuring great soil. Here’s how we built that Greenhouse for under 200! 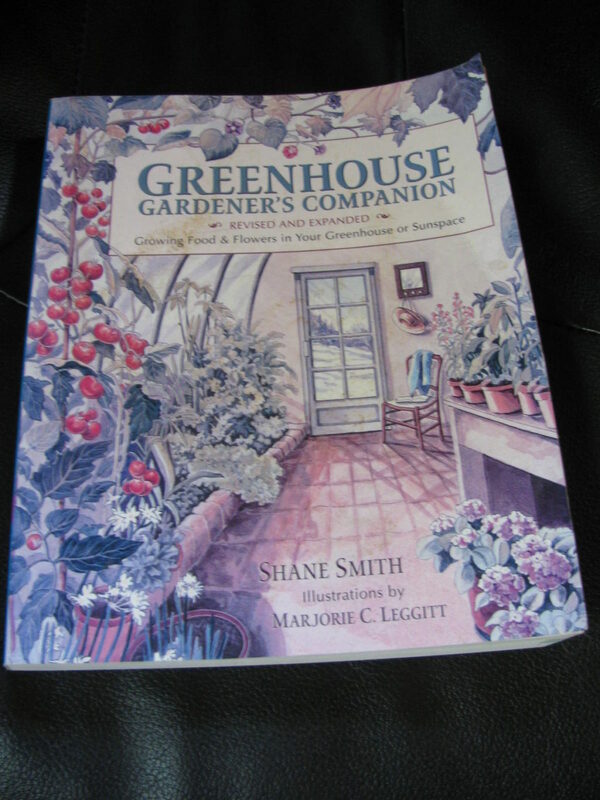 If you’re thinking of building your own greenhouse (and why not?) here’s a great book to get some ideas from. I bought it the year before we built ours and had the chance to read it over several times. There are a lot of great tips and hints in the book. People can grow beans outside here, but remember that beans are a heat loving plant and cannot take any frost. When I do grow them outside, I cover the rows with Remay cloth every evening and remove it every morning. This can get to be quite a pain on the daily chore list and if I even forget ONE time to put the cover back on, I may pay the price. It depends on how cool it gets that same evening. The beans may be fine in the morning or they could be frosted over – they can never come back from that. 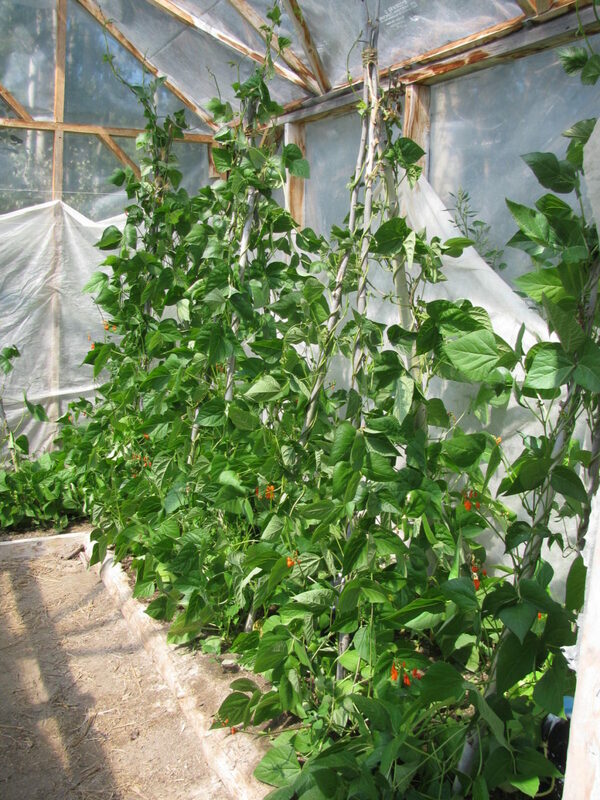 Planting pole beans in the greenhouse minimizes the risk of frost damage and boosts up the harvest potential. It’s toasty warm in there all day long, and I make sure to water at least twice a day. With it as hot as it is right now here, I’ve been watering three times a day. Usually when we have a larger garden planted we use a lot of timers and soaker hoses, but I didn’t do that this year. 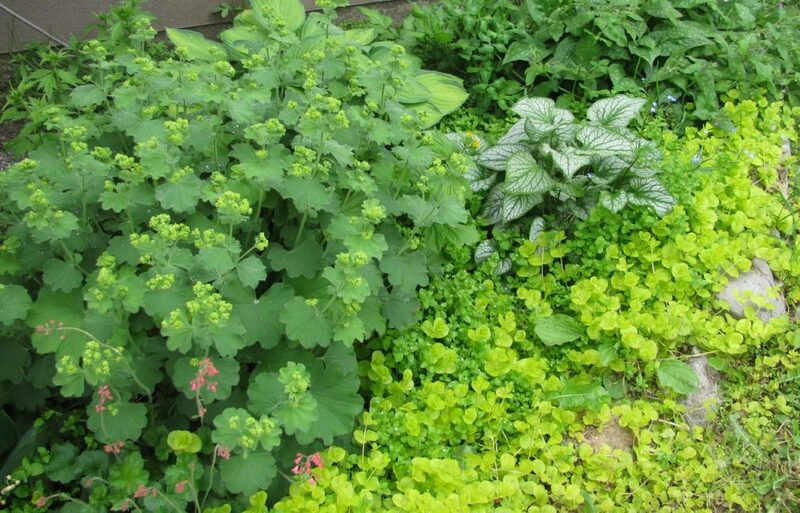 The main garden is small enough this year to handle with one oscillating sprinkler. 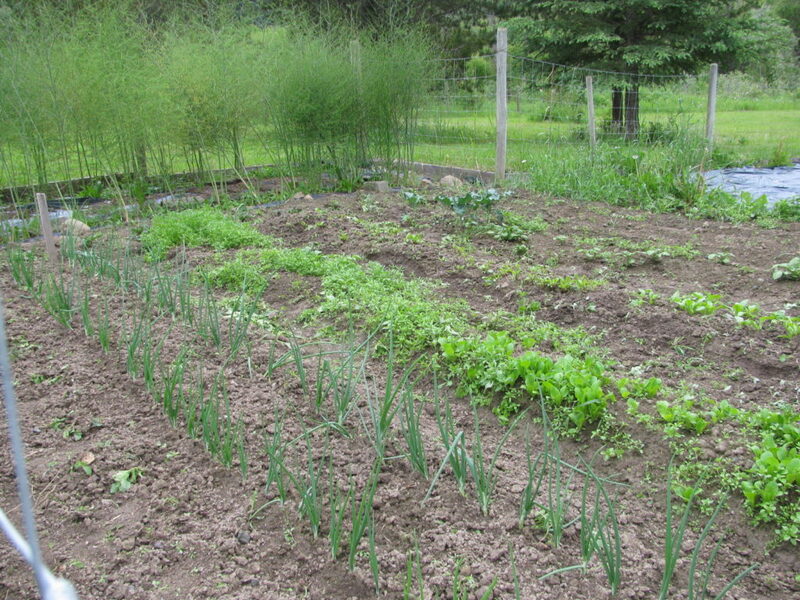 The Berry/Garlic Bed has another sprinkler set up, so this year, it’s just a matter of turning the tap on and off. I’m hand watering the greenhouse this year, instead of using the usual soaker hose and timer set up. I’m enjoying watering this year, probably because I have more time. Those black bottles? We use these bottles as heat collectors during the season. That’s why they are sitting inside the teepees; we fill them with water and spray paint them black. They will get nice and hot when the sun is shining and release that heat late in the evening when the temperatures go down. 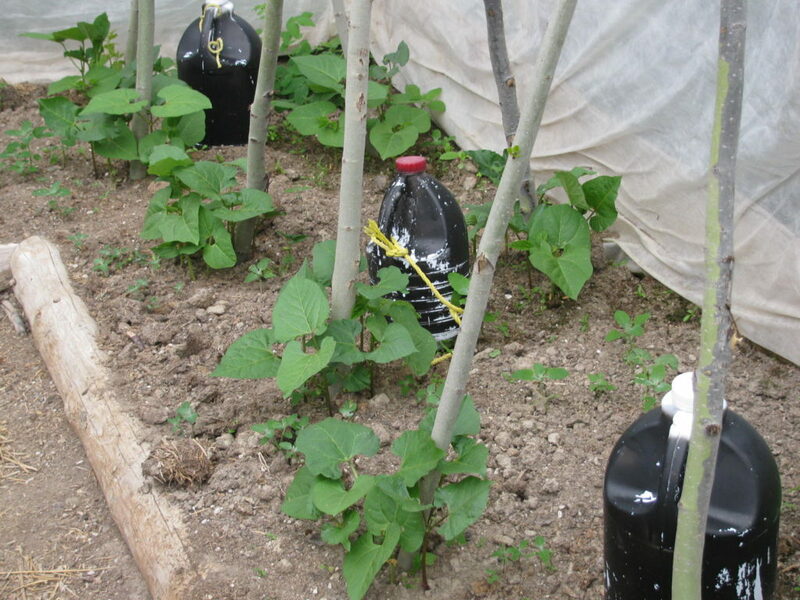 During the Winter, those bottles are tied onto the tarp that we put over the greenhouse. The bottles weigh down the tarp, in case of winds. We’ve been using this system ever since we first built the greenhouse. It’s an inexpensive way to get more heat to the plants and protect the greenhouse in winter. We used Alder saplings to make the runner bean teepees. Easy to get and easy to hammer them into the ground. I like to plant 4 or 5 bean seeds around each of the teepee poles. 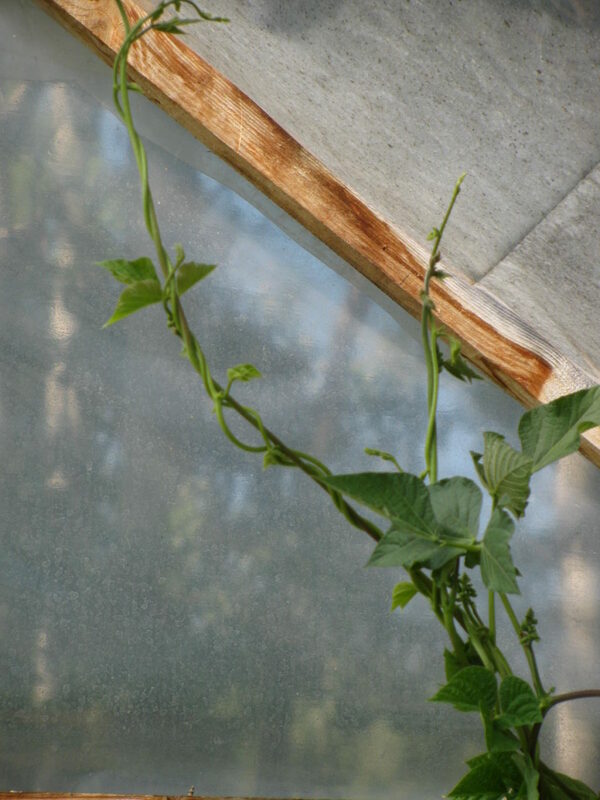 As long as my teepee supports are thick, they can hold a lot of bean vines without any problems. You can see I stapled a layer of Remay cloth all around the inside of the Greenhouse. It adds about 2 degrees and when the temperatures dip here, those 2 degrees can make the difference of having food or not. I’ll take what I can get. Now the runner beans have grown up past the top of the teepees, and the flowers are forming. 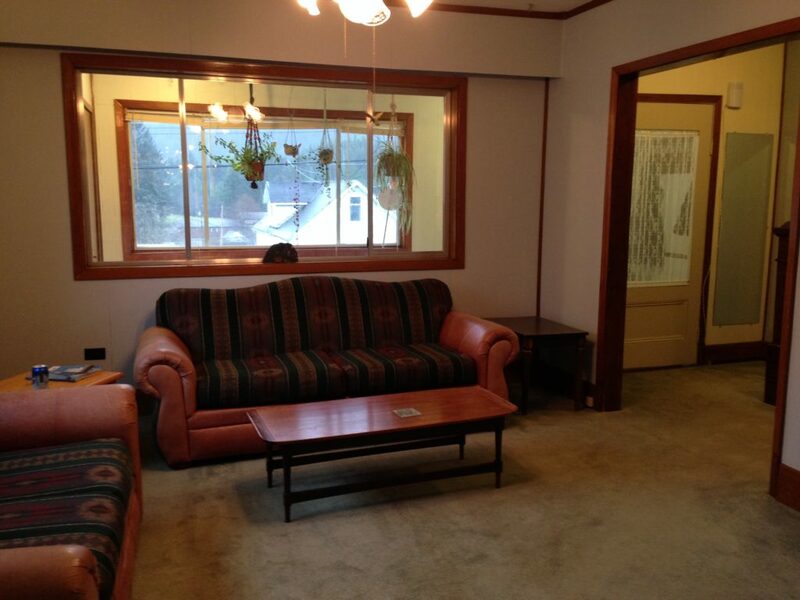 Don’t those plants look healthy? They will just keep growing and wrapping themselves around anything that can support them. 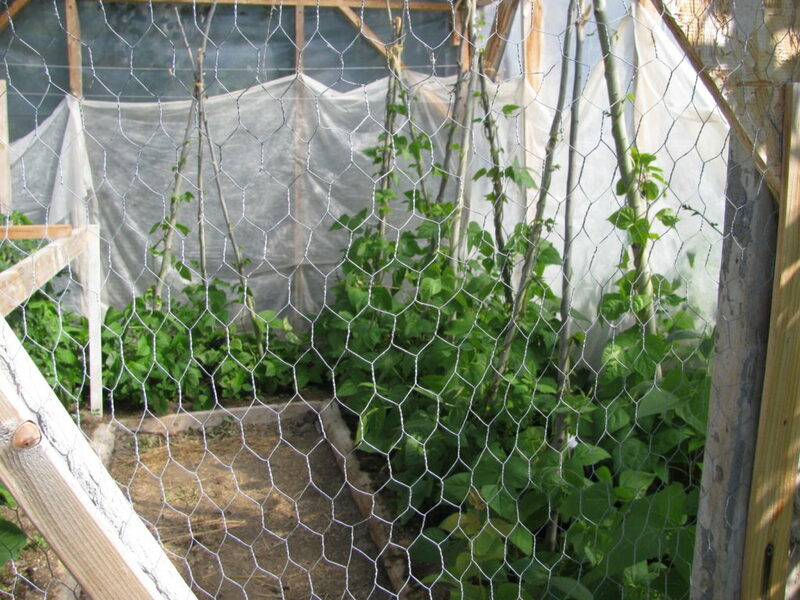 Since the greenhouse door is framed with wood and covered with chicken wire, it keeps the pests out I want to and it doesn’t make it too difficult for the bees to get in there. We have a roll up poly door that we roll down each evening to keep the cool air out. 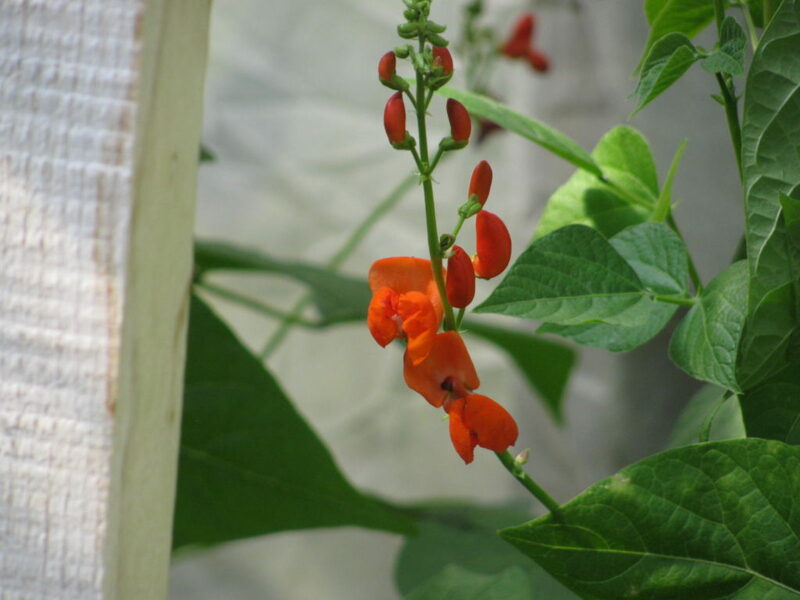 Scarlet Runner bean flowers are so pretty. It shouldn’t be long till I am pressure canning beans, and hopefully I will be canning a LOT of them! Here’s how to pressure can beans safely. After canning I store them in the cold room until we are ready for them. Want a Greenhouse? See how we built our own Greenhouse for under $200! Want to see how I go grocery shopping without ever leaving my house? Come along with me on a weekly trip! 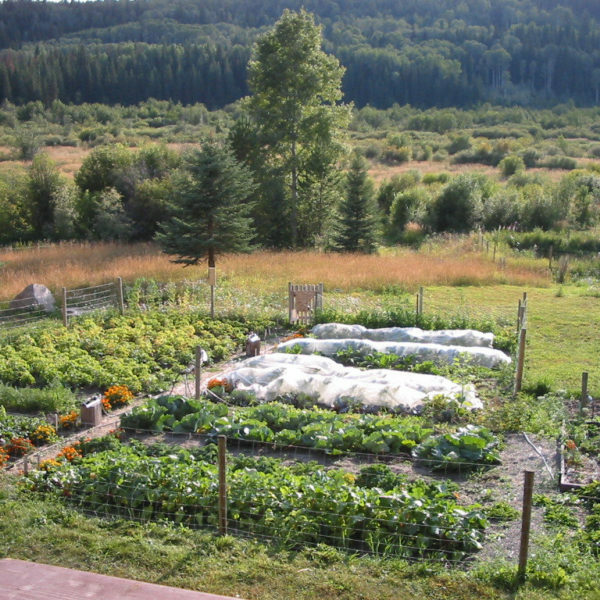 As for the vegatable garden: I have lots of green tomatoes, but no red ones yet. I’ve picked about three little batches of ‘Royal Burgundy’ bush beans so far, and they are lovely and tender and prolific here. Runner beans are starting to produce little bitty runner beans. I had lettuce starts outside hardening off, and then this hot weather hit, so I took a few losses there–I need to plant them out when it cools off a bit later this week. Corn is tasseling up nicely. Potatoes are producing some of the first new potatoes of the season. I could eat them all now at this stage, but am trying to be patient and wait for a bigger crop. I have four nice green peppers–just waiting for them to ripen and turn red before I pick them. Pumpkins are producing massive vines and several little baby pumpkins. I have a squash that popped up out of nowhere on its own, and it will likely produce something that is not edible but will be great for autumn decorating, which is cool. The late-season raspberries are putting out lots of green and pink berries–will be ready in a couple of weeks, maybe. Lots of basil to use now, and dill is about ready to start using as well. 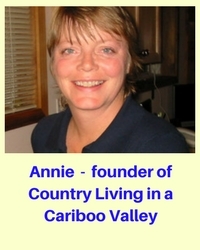 That’s a funny surprise Kari, I hope you have a great harvest. I have lots and lots of flowers but no beans yet, I’m hoping any day now I will see some.